Starting in 1996 as a 30-minute radio program broadcast almost exclusively to the University of Toronto community, “Animal Voices” has since grown by leaps and bounds. The live show now occupies a weekly full-hour timeslot and, with the help of internet and satellite radio, listeners are tuning in from all over the world, from Australia and Hungary to Singapore and Argentina. “Animal Voices” (AV) has a broad focus, featuring a wide range of interviewees including lawyers, bakers, academics, athletes, filmmakers, authors and all sorts of activists to discuss veganism, social justice, animal advocacy, environmentalism and politics. While the show has had a changing roster of dedicated volunteers over the past 11 years, Lauren Corman has been a constant on the mic since 2001. Brandy Humes recently caught up with Lauren and turned the tables on the interviewer extraordinaire to learn more about the show, her experiences as a host, perspectives about advocacy and the power of radio. Why did you decide to focus your advocacy efforts on the “Animal Voices” (AV) radio show? There’s a bunch of different reasons. 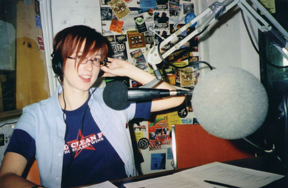 For one, I had been heavily involved in a feminist radio show during my undergrad, and that really got me turned on to the medium. I felt we were promoting some kind of public dialogue, talking about a lot of issues many people shy away from. That’s always been important to me. I also wanted to try out some theories I was learning in school. My feeling has always been that, regardless where you stand on an issue, you should have access to multiple perspectives. Conversation is a central aspect of my ethics. Bell hooks’ writing on academic accessibility also had a pretty profound effect on me. When I got to Toronto in 1999, the timing was perfect, as Mirha-Soleil Ross, the then-host of “Animal Voices,” was looking to pursue other projects and offered the position of host to myself and two friends. AV is different from a lot of other animal advocacy radio shows and podcasts in that it attempts to draw links and show the overlaps between social justice, environmentalism and animal issues. The feminist theory, professors and punk bands who influenced me during my early political years began with the premise that all oppressions are linked. I’ve taken that seriously. For example, animality is often invoked to degrade various human groups, or as a way for those groups to name their degradation. For instance, people often say things like, “They’re nothing but a bunch of animals,” or “They treated us like dogs.” Also, aspects of the animal movement are in danger of becoming isolated if we don’t recognize how we alienate others and negate other liberation struggles, by not interrogating our own prejudices, biases and privilege. We can’t afford that kind of insular self-righteousness. The show frequently focuses on international animal groups and their work. Can you speak about why you have taken that route? One of the reasons international shows are important to me is because North Americans too often assume that animal advocacy doesn’t happen in the rest of the world, which isn’t true. Ideally, the show serves as a platform to swap ideas across people, groups, cultures, countries and continents. AV begins with the basic assumption that animals matter and deserve consideration. This is a departure from most mainstream media, which present themselves as not having bias. For example, AV does not give a platform to the spokespeople of the Canadian Poultry and Egg Processors Council in the way another media outlet would. Can you speak to that? A lot of mainstream media starts with a clear bias as well: humans and the environment, and issues of inequality matter, however shallowly addressed. That isn’t perceived as bias, at least not by liberals and leftists. Not caring about animals is also biased. I have a perspective, just like anyone else, and I’d rather just be transparent about it. Also, animal exploitation industries make huge claims about animals, but it’s advocates who are considered biased. While our understandings will always, ultimately, be partial and anthropocentric, to not address the arrogance and exploitation perpetrated by these industries is unconscionable. We don’t have industry representatives on “Animal Voices” because these people already have the ear of the mainstream media. The program shouldn’t be yet another platform to promote the commodification and harm of animals. Yet, I ask lots of “devil’s advocate” type questions. I want to address concerns that average, even entirely unsympathetic, listeners might have. But I don’t want to spend the whole hour just running around putting out fires. The critics raise important questions, but they’re not the only important questions. What are some of the difficulties, stumbling blocks and surprises you have experienced along the way? There’s plenty of room for regret on live radio. It’s risky, which is part of the spontaneity and excitement. When someone, including myself, says something that is ignorant and potentially harmful, it can be difficult. Occasionally I can challenge these statements, but many times I wish I had responded differently. Over the years, I’ve learned to handle these situations better and relax about the mistakes. Interviewing has really become meditation: Breathe deeply, stay present, do your best, and let go. For me, it’s about opening up the conversation, rather than arriving at some perfectly ethical, fixed place. On a technical level, my speaking and listening has changed. For phone interviews, the regular body signals and conversation cues are necessarily gone. Unfortunately, the vocal affirmations don’t always make for good radio. Another challenging issue is silence. Pregnant pauses can hold a lot, and they can help people collect their thoughts. On the radio, these pauses are sometimes perceived as “dead air.” It’s hard to negotiate. What are some of the most memorable shows and why? That’s incredibly tough. One that immediately stands out, though, is the interview with Gail Eisnitz. She wrote Slaughterhouse, a courageous book which concretely illustrates how the welfare of slaughterhouse workers and the welfare of farmed animals are closely intertwined. By highlighting workers’ stories, she inspired change and confronted those who vilify these laborers. The interview about Stories Rabbits Tell was also a wonderful program. I loved the authors’ holistic, layered approach: They knew a diverse group of rabbits, who were their friends and teachers; they wrote about rabbit natural history and cultural iconography; and they tackled the rabbit fur, meat and vivisection industries directly. Reading the text and doing the interview was like opening hundreds of little windows. The shows with local poet, James Strecker, have really stuck with me, too. Through our conversations about poetry and burn-out, his responses were remarkably honest and frank. He’s someone who deeply believes in bearing witness, and his love of animals, nonhuman and human, is palpable. What does the future hold for “Animal Voices”? Rob Moore, our resident newsperson and co-host, has been on hiatus lately to pursue his online fitness business. He and his smooth voice will be back in the future. We also want to bring in a group of rotating co-hosts, to switch it up. For example, Steve Fish, who owns the vegetarian shoe store Left Feet will likely be in studio to host with me from time to time. I’d like to have “correspondents” who keep the pulse of animal issues in their communities. More debate shows are in the works, too. And it would be great to hear more actual animal voices. We’re still discussing how to approach this, though we’ve experimented a bit. We might move away from the standard interview structure of the program, not entirely, but include some soundscapes and recorded talks from events. As always, there are a number of upcoming shows that I’m excited about, but I don’t want to give away too much. Brandy Humes is an animal, eco and social justice educator, an avid gardener and vegan baker. To learn more about “Animal Voices,” and to search the archive of 190 downloadable shows, visit www.animalvoices.ca.